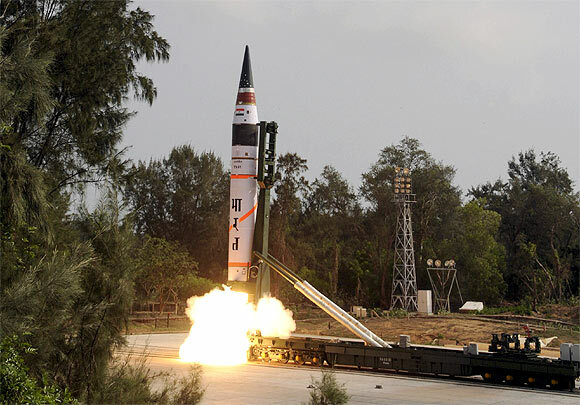 'India must close the missile technology gap with both China and Pakistan as early as possible, or else the credibility of India's nuclear deterrence will remain suspect,' says Brigadier Gurmeet Kanwal (retd). 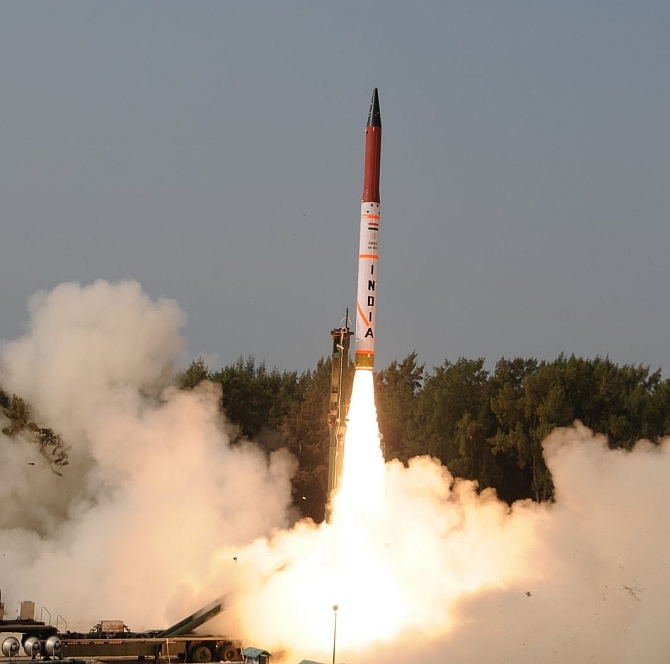 IMAGE: India tests its short-range nuclear capable ballistic missile Agni-1. Though India is a reluctant nuclear power, nuclear deterrence will continue to play a crucial role in India's national security strategy over the next few decades. The current international trend is towards more modern, high quality nuclear forces, even though the present efforts of the US and Russia to reduce the number of warheads and missiles will continue. Both China and Pakistan are engaged in the upgradation of their nuclear warhead and delivery systems capabilities. With some nations and various terrorist groups expressing their nuclear ambitions openly and the possibility of a political-military meltdown in Pakistan, even though the probability is low, the proliferation of nuclear weapons around India remains a cause for concern. In line with the emerging trends, India too must endeavour to modernise its nuclear warheads and delivery systems and keep its option to test open -- if it ever becomes necessary in the future. In particular, India must close the missile technology gap with both China and Pakistan as early as possible, or else the credibility of India's nuclear deterrence will remain suspect. The recommendations made and the foreign policy imperatives mentioned below merit the government's attention. IMAGE: The 6,000 tonne INS Arihant, India's first indigenous nuclear submarine. India must step up efforts to acquire missiles with a range between 5,000 km and 10,000 km for better long-range deterrence against China. The Agni-5/Surya programme, which can benefit from the Polar Satellite Launch Vehicle (PSLV) and the Geosynchronous Satellite Launch Vehicle (GSLV), needs to be given high R&D priority. For a nation that has adopted a 'no first use' nuclear posture and is willing to absorb a nuclear strike that may cause large-scale destruction and cripple part of its nuclear forces, genuine deterrence can be provided only by a robust, infallible and potentially insuperable nuclear deterrent capability including SSBNs armed with nuclear-tipped SLBMs. It is imperative for India to make all efforts to acquire and operationalise its SSBNs as early as possible. While the INS Arihant was reported to have been inducted in October 2016, the INS Aridhaman is expected to be launched. Together, these two SSBNs will substantively enhance the quality of India's deterrence. 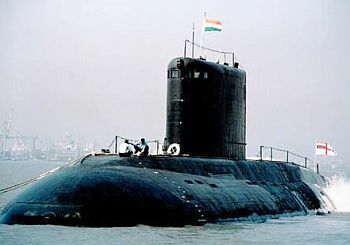 Till such time as SSBNs enter service with the Indian Navy, a small number of surface combat ships in both the Eastern and the Western naval fleets must be equipped with nuclear-tipped missiles to add to the uncertainties of the direction of launch that an adversary must consider. IMAGE: The Agni-5 missile can deliver a nuclear bomb anywhere in China. As India has conducted only six nuclear tests, the country's nuclear warhead designs are based on only a small database. Hence, despite the availability of sophisticated computer simulation and modelling techniques for improved warhead design, India must retain the option to carry out further nuclear tests as and when it is considered technically necessary by nuclear scientists and is politically feasible to do so. Therefore, signing the CTBT is not a viable policy option for India in the near future. However, as a responsible nuclear power, India must continue to honour all the provisions of the CTBT. Similarly, India's IRBMs have been inducted into service after only a limited number of flight tests. Additional tests of the Agni series of missiles should continue -- both to inspire confidence among the users manning these missiles as well as to enhance the credibility of India's nuclear deterrence by showcasing their technological maturity and accuracy of delivery. Indian diplomacy must endeavour to add value to credible deterrence through appropriate interventions in international fora. 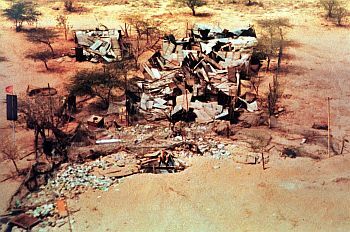 IMAGE: 'This is the picture of ground zero where the thermo-nuclear device was detonated in May 1998 in Pokharan. No crater was found at all! This picture tells the story that we have to do more homework. Indeed, we have to do more honest homework,' said K Santhanam, a former Defence Research and Development Organisation scientist dramatically holding the picture in his hand at a 2009 press conference. You can read more from that press conference here. The deployment of effective BMD systems to defend value targets and provide point defence to important installations will considerably enhance the quality of India's deterrence. Endeavours must continue to acquire this capability ex-import as well as through indigenous R&D as early as possible. However, actual deployment should be subject to whether China and Pakistan opt for BMD systems. In view of the MIRV developments in China, India's research programme on MIRV technologies has been correctly made public. However, the deployment of MIRV warheads on India's IRBMs must be undertaken only with due caution so as not to spur an arms race in Asia. India is faced with a continuing nuclear warhead and missile technology nexus between China and Pakistan. As no nation can go it alone in an endeavour as complex as nuclear deterrence, it is in India's interest to seek out strategic partners who might stand by New Delhi diplomatically and, where possible, by providing technological support that does not violate treaty obligations. 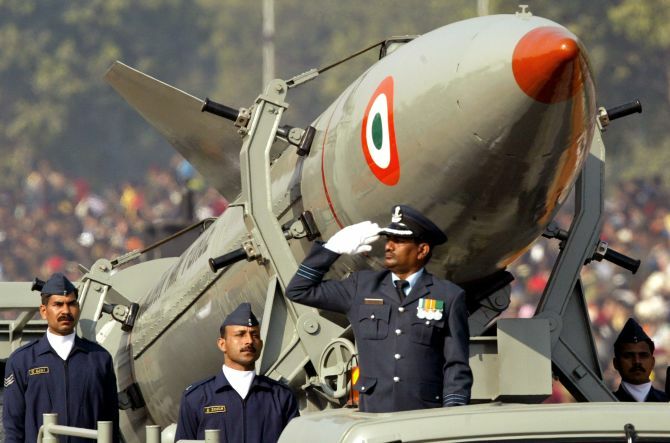 In view of the doubts raised over India's nuclear tests of May 1998, tangible measures need to be adopted by way of signalling to enhance the credibility of India's nuclear deterrence. Similarly, nuclear signalling must be conducted to convince India's adversaries about the resolve of the political leadership to order a 'massive retaliation'. New nuclear weapons States, especially those in India's neighbourhood such as Iran, are not in India's national interest. India should therefore cooperate with the international community in furthering non-proliferation efforts even while remaining outside the NPT. India must continue to make efforts to enhance nuclear CBMs and NRRMs with Pakistan so as to reduce the risk of accidental and inadvertent nuclear detonations. 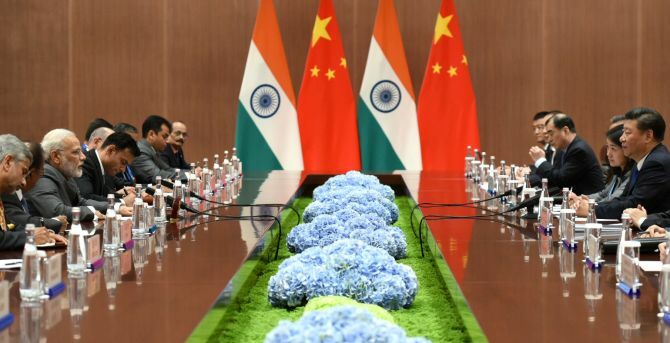 Despite China's stubborn refusal to accept India as a State with nuclear weapons, India must extend these efforts to negotiating similar CBMs and NRRMs with China as well. It is not in India's interest to sign the CTBT at present as it is important to keep the option for further nuclear testing open for political purposes, even though it may not be critical to test again in the near future for technological reasons. India should consider joining the Fissile Material Cut-Off Treaty (FMCT) only after sufficient fissile material has been stockpiled for producing the number of warheads considered adequate for credible minimum deterrence. However, India should continue to support the FMCT and participate in the negotiations which are likely to go on for five to ten years or more. For counter-proliferation efforts to succeed, international support is needed for the Proliferation Security Initiative (PSI) and the Container Security Initiative (CSI) launched by the US. India should join these initiatives as an equal partner after ensuring that Indian interests are safeguarded. India's nuclear deterrence policy should work in parallel along twin tracks: Continue to enhance the quality of India's nuclear deterrence and preparedness while simultaneously working towards the ultimate goal of achieving total nuclear disarmament in as early a time frame as possible. Total nuclear disarmament is in India's national interest as it will eliminate the risk of nuclear war and also provide a level playing field. India must strive to achieve this goal through vigorous diplomacy by mobilising all its strategic partners and friends in the United Nations. This should be an important foreign policy objective. The political leadership and the senior bureaucracy must be regularly briefed and sensitised about the complexities of nuclear deterrence so that they can make realistic assessments of military options during crises. Short familiarisation capsules should be conducted regularly by HQ Strategic Forces Command for members of Parliament and mid- and senior- level bureaucrats. Civil defence and rescue and relief measures to deal with the deaths, casualties, damage to materials and the radioactive fallout that a nuclear explosion could cause, if deterrence fails, need to be streamlined. The raising of additional nuclear disaster relief battalions beyond the four units that have been raised so far needs to be considered. Military equipment should be hardened against disruption by the electromagnetic pulse (EMP) that is generated by nuclear explosions. In fact, as a counter measure, it would be beneficial to undertake research and development of equipment that can generate non-nuclear EMP. 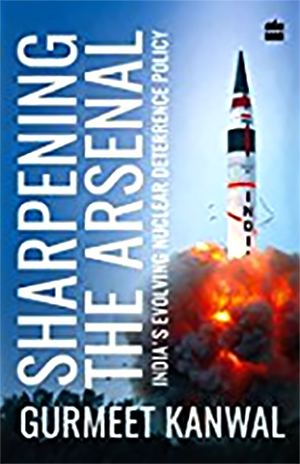 Excerpted from Gurmeet Kanwal's Sharpening the Arsenal: India's Evolving Nuclear Deterrence Policy, HarperCollins Publishers India, 2017, with the author's kind permission.